This is an amazing article from HS about one of my past favourite brands, Duffer St George, their store was always first port of call on shopping trips from Middlesbrough to London. Nearly everywhere I go, the folks in charge who know what they’re talking about seem to have Duffer affiliations of some sort. If your perception of the Duffer of St George brand is from the Debenhams and JD affiliations that put it on the high street, that’s just part of the story. This is a store than seems to have involved a slew of characters over the years, launched a lot of brands and for Duffer alumni, there seems to have been quite a success rate through talent and the sheer volume of connections made on the job. Inspired by the title of a Richard Lyne story called The Duffer of St George’s in The Champion Book for Boys — the kind of story compendium depicting an instantly dated, otherworldly view of Britain — it’s the brainchild of Marco Cairns, Eddie Prendergast, Barrie Sharpe (an early adopter in reappropriating a 1950s look) and Clifford Bowen who started the company 1984 as a market stall shifting vintage army surplus, baker boy hats and workwear (which had undergone a resurgence via magazines like The Face), leading to further acquisitions and custom footwear creations. In 1985, the Portabello Street store opened and in September of that year, Duffer and Barry Sharpe’s pioneering rare groove Cat in the Hat night started at the Comedy Club in Leicester Square with Sharpe and friends DJing before it moved to the Limelight on Shaftesbury Avenue with guests like Norman Jay, then shifted to Mayfair with an emphasis on house, garage and disco. Resurrecting and introducing brands at the Portabello store, their own mix of luxury, tradition and flamboyance would spawn a look based on their own perception of cool at street level — streetwear in its truest form. One example was the ‘Yardie Cardie’ look that merged dancehall, casual and Italian style — Sharpe’s own Sharpeye line periodically puts out makes a great version of that cardigan. In 1987, the Soho Duffer store opened on D’Arblay Street and pushed a smooth but psychedelic 1970s look that made them responsible for a full-on revival that would connect to the acid jazz (which Sharpe would be integral to) boom’s look at the end of the decade. During the Soho years the fixation with deadstock old school trainers, a preoccupation with selvedge lines on denim and aspirations to own some Schott can all be blamed on Duffer and four stripe tracksuits and Barnzley’s oft-imitated smiley face shirts shifted from the shelves. 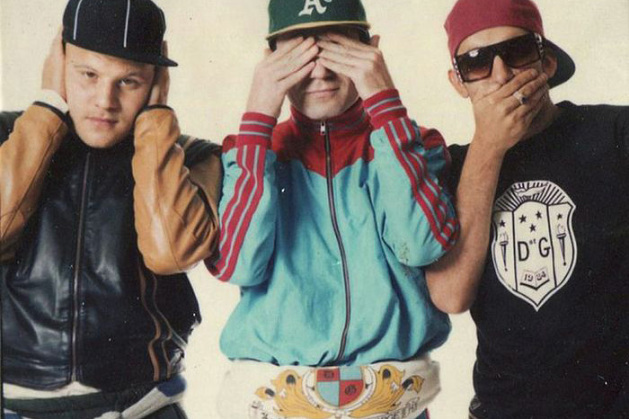 They fueled the baseball cap boom around 1990 and would create their own hats as well as bringing New Era to London and doing parodies of high-end lines like Gucci long before it was played-out. Duffer would be sold in NYC via James Jebbia and Mary Ann Fusco’s Union store and Japan seemed smitten with their offerings too. Not content with creating its own products and setting up their own stores to cater to and create an audience, Duffer would help set up shows for the new breed of maverick menswear designers. After the opening of the Covent Garden store in 1993 and with Duffer still creating trends and being some of the original resellers with their knack for picking up products like the Nike Air Rift and selling them for wild markups, investors entered the picture and Sharpe left to set up the aforementioned Sharpeye line (another of the great British brands), complete with a series of stores. By the late 1990s, the heavily branded Duffer zip hoody was a status symbol with a certain mass appeal about it as well as taking their footwear rollout more seriously to coincide with that popularity, resulting in their strange Spanish and Italian made asymmetric, centre seamed and driving shoe styles – with a hint of Clarks – under the Yogi name. Duffer would expand to several stores before almost going under in 2008, but after the Duffer by St George pieces for Debenhams were borne from a 2007 deal, JD Sports got involved and made it theirs — now the puffa and retro trainer realm that Duffer helped forge is a norm and JD push that look, so, while it’s a long way from the detail orientated one-upmanship of the Duffer brand of old, it makes a certain sense. Eddie Prendergast and Steve Davies went on to found Present in east London, which keeps the old Duffer store spirit (the ability to edit and preempt) alive and Marco Cairns is still with Duffer, whose Japanese license pieces feel closer to the mid 1990s Duffer approach. But that’s just my own rambling and it misses a lot of key moments and other pieces of the timeline (I’m open to all corrections) — the Duffer story deserves to be told by those who were there, because its influence on how southerners dress and how British menswear stores are stocked is colossal. The people that made clothes based on how the sharper man on the street was dressing ended up influencing how the man on the street dresses as well as the cool kids too. With that in mind, this Kickstarter campaign to fund a short Duffer documentary, Style Brokers: the story of Duffer of St George makes a lot of sense. Go visit Strike Pictures’ page there and help make this happen. I always wanted to see a good retrospective article on Duffer’s history and legacy, but a film is a far better proposition — I hope they manage to speak to all involved. Gary Warnett is a writer from London, best known for his far reaching knowledge in sneaker and streetculture. Read more from Gary on his blog “Gwarizm” here.